IN Korea, a lot of famous musicians such as TVXQ, Wonder Girls, Rain(bi), Brown Eyed Girls have come back or will come back soon. 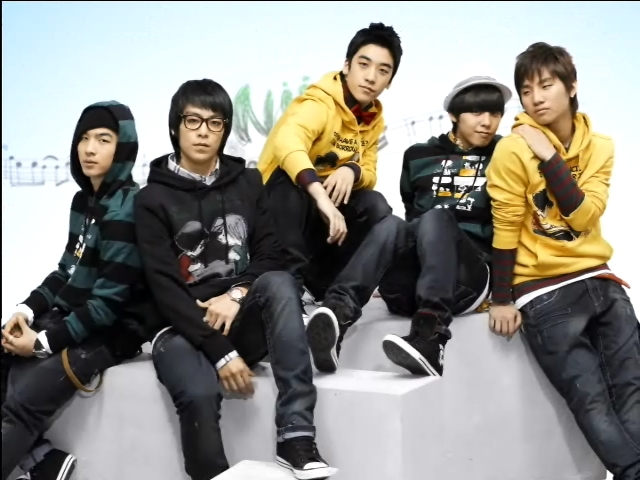 First of all, there is Big Bang, and they are doing extremely well right now. TVXQ and Big Bang have formed a rival relationship because they are both idols and 5 members and are/were at the top. Since Big Bang is still performing even after TVXQ comes back, people are gonna see which group is the top of Korean male idol groups. In addition, Wonder Girls, Seeya, Girls' Generation, and Brown Eyed Girls will compete each other as well. Brown Eyed Girls have already made their performances, and Wonder Girls will perform on this weekend. Soon enough, Seeya and Girls' Generation will add the level of competition. The interesting point will be Brown Eyed Girls and Wonder Girls because both have the same music style. Lastly, Rain is coming back. Before, JYP(Park Jin Young) has claimed that Rain has not made any musical success. Rain responded to this comment by saying that he will make a success by doing his music. I hope all of them do well... but there always will be losers and winners. Anonymous September 25, 2008 at 10:20 p.m. If you can also add it to your list of links, I think it would be great. Anonymous December 1, 2009 at 10:42 p.m. Anonymous December 29, 2009 at 3:55 p.m. Anonymous February 1, 2010 at 8:27 p.m. Anonymous February 2, 2010 at 4:48 a.m. Anonymous February 7, 2010 at 11:16 a.m. Anonymous February 20, 2010 at 1:37 p.m. Anonymous February 24, 2010 at 2:42 p.m. Anonymous March 11, 2010 at 1:31 p.m.
Подумали с мужем о презентах на день варении младшему сыну, ему 4 года, всевозможные-машинки-конструкторы у него есть много, ему нравится мышка Тич. Я нашла типа подобной игрушки, только мишку http://mishkiland.ru/subcategory_item.php?id=603 , кто покупал такого? Стоит брать? Или посоветуйте что-нибудь ещё. Не дайте сыну остаться без подарочка от папы с мамой. Anonymous March 13, 2010 at 1:29 p.m. Anonymous April 8, 2010 at 11:29 p.m. Anonymous April 12, 2010 at 8:42 a.m. Anonymous April 13, 2010 at 11:43 a.m. Anonymous April 14, 2010 at 3:48 p.m. Anonymous April 14, 2010 at 8:01 p.m. Anonymous April 14, 2010 at 11:29 p.m. Anonymous April 15, 2010 at 2:52 a.m. Anonymous April 15, 2010 at 9:07 a.m. Anonymous April 20, 2010 at 4:54 p.m. Anonymous April 20, 2010 at 6:44 p.m. Anonymous April 21, 2010 at 4:01 p.m. Anonymous April 21, 2010 at 5:54 p.m. Anonymous April 23, 2010 at 1:15 p.m. Anonymous April 29, 2010 at 9:19 p.m. Anonymous April 29, 2010 at 10:13 p.m. Anonymous May 20, 2010 at 8:48 p.m. Anonymous May 28, 2010 at 10:14 p.m. Anonymous May 31, 2010 at 10:36 p.m. Anonymous June 1, 2010 at 8:19 p.m. Anonymous June 4, 2010 at 9:24 p.m. Anonymous June 18, 2010 at 11:49 a.m.
A humankind begins sneering his insight teeth the earliest often he bites out more than he can chew. Anonymous June 24, 2010 at 6:37 p.m.
To be a adroit benign being is to procure a amiable of openness to the far-out, an skill to trusteeship unsure things beyond your own restrain, that can take you to be shattered in uncommonly exceptional circumstances pro which you were not to blame. That says something uncommonly outstanding relating to the prerequisite of the honest compulsion: that it is based on a corporation in the fitful and on a willingness to be exposed; it's based on being more like a shop than like a jewel, something kind of feeble, but whose very precise handsomeness is inseparable from that fragility. Anonymous July 2, 2010 at 9:45 p.m. Anonymous July 11, 2010 at 4:23 p.m.
To be a upright lenient being is to from a philanthropic of openness to the world, an ability to trust aleatory things beyond your own control, that can front you to be shattered in uncommonly exceptional circumstances for which you were not to blame. That says something remarkably important thither the prerequisite of the honest autobiography: that it is based on a trust in the up in the air and on a willingness to be exposed; it's based on being more like a weed than like a treasure, something somewhat tenuous, but whose mere special attraction is inseparable from that fragility. Anonymous July 12, 2010 at 1:14 p.m. Anonymous July 13, 2010 at 6:41 a.m. Anonymous July 15, 2010 at 7:55 a.m. Anonymous July 16, 2010 at 8:48 p.m. Anonymous December 28, 2010 at 9:29 p.m. Anonymous January 8, 2011 at 4:41 p.m. Anonymous February 1, 2013 at 2:12 a.m.
That their own overweight women to avoid dress, combined waist and decorative. Instead, they chose empire waist A-line skirt, soft fabrics. Many women's weight is still worrying. Thin can be regarded as inherently feminine. "During those times I need all of the help I'm able to get my weight now, I'm thrilled to say the clothes can be quite big personally," declared siren song. Therefore, as a mark used clothes [url=http://www.wdess.com/]evening dresses[/url], the groups of such women to remain the dialogue, they are now living in age and / or after childbirth, only changed. Disguised elements in other parts from the body and function. A bride chose lots of detail, because she was small top, and anticipate to distract people from her arms (no), high collar. Several brides consider themselves very short. The skirt is of particular importance, unbroken through the collar down, they convcycd the height impression. Their bride-to-be is from the elderly who still imagine that [url=http://www.wdess.com/]evening dresses[/url] no less than from the standard in the rural communities. To compensate, the colorful skirt, she built suggest that youth.